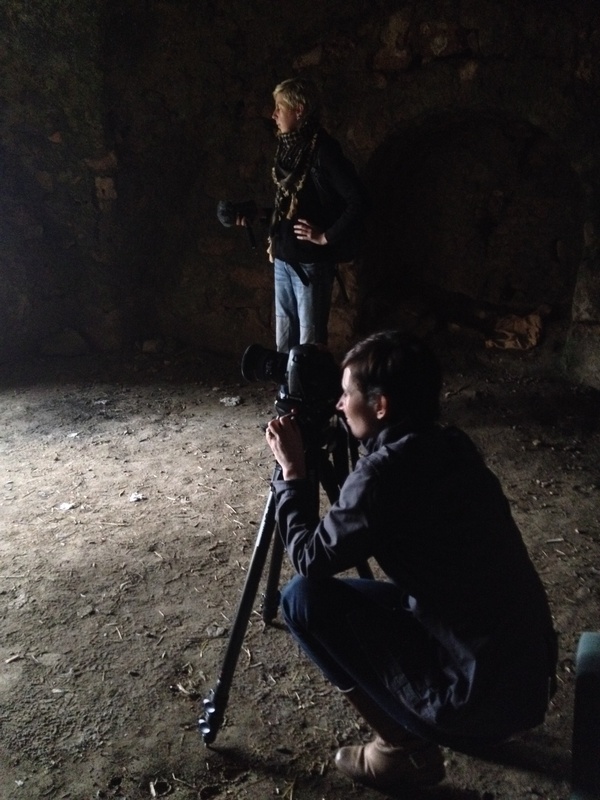 In March 2013 I working in Israel/Palestine with Elle Flanders and Tamira Sawatzky of Toronto-based Public Studio on their newest film installation, What Isn’t There. The piece comes from nearly 20 years of photographing and filming on the sites of former Palestinian villages in Israel, an exploration of the politicized landscape in all its beauty, banality, and absurdity. 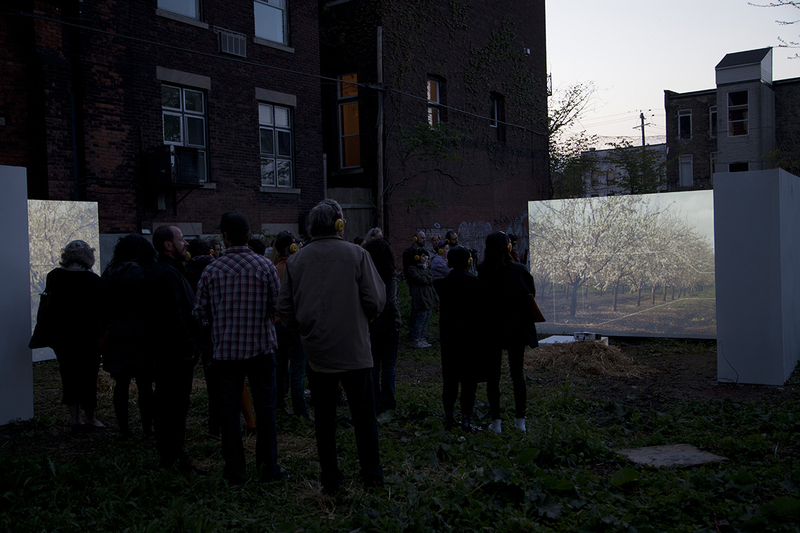 The installation had its premiere in Toronto on May 22, 2013 in a one-night outdoor presentation, and consists of four channel video, accompanied by stereo sound (which visitors listen to on wireless headphones). It’s a powerful piece, which truly immerses visitors due to the design and scale of the screens, the intimate sound, and very formal yet generous presentation of the subject. I’m super pleased to be part of the team, composing and designing the sound. Public Studio never rests, so we’re busy at our terminals working on a commission for Ryerson University, another audio/visual work called Drone Wedding. Wedding industrial complex meets military industrial complex, war meets the everyday under a familiar sky…. I wish I could say such an idea were a farce, but too often drone strikes abroad have targeted innocent civilian gatherings like weddings and parties. Drone Wedding will be up and running for the fall semester, from September 17-December 19, 2014 on the Ryerson University New Media Wall, in downtown Toronto, Canada. 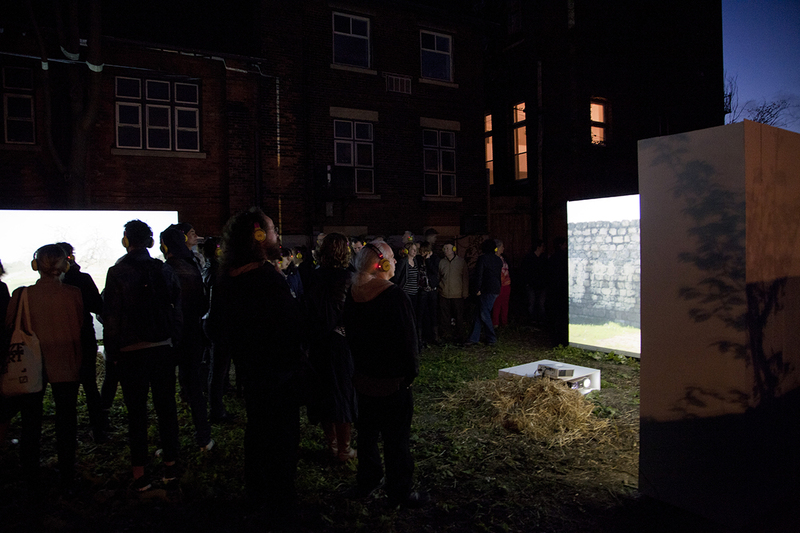 I began working with Elle Flanders and Tamira Sawatzky aka Public Studio in 2011, when I composed music and did sound design/installation for their multi-channel film work Road Movie. 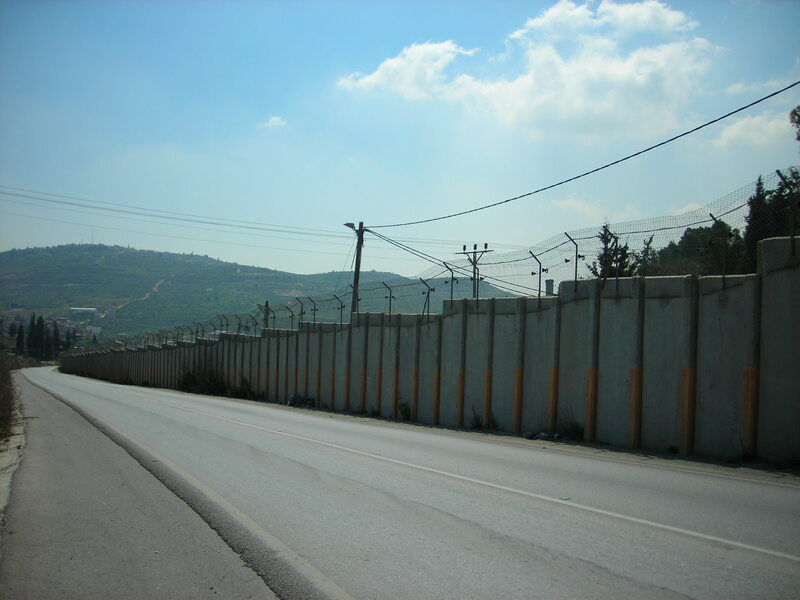 The piece explores the segregated road system in the West Bank, with perspectives from Israelis and Palestinians. 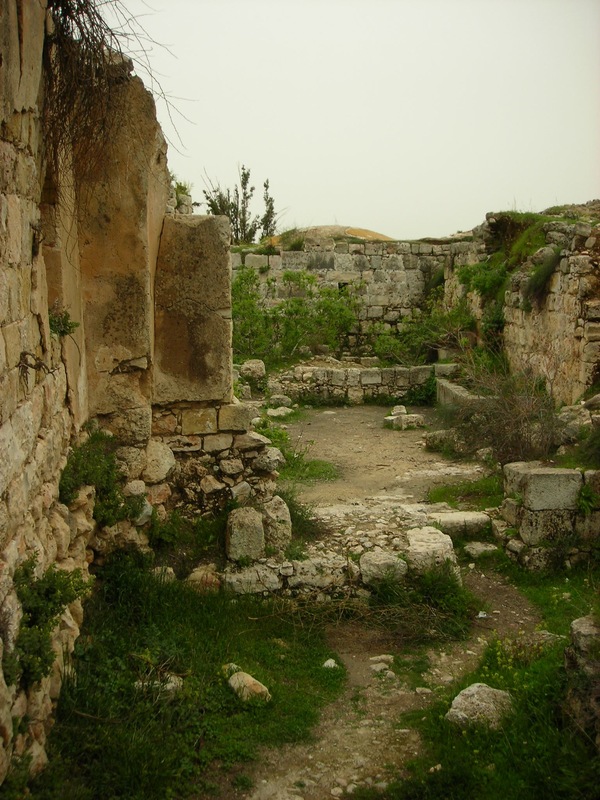 Recently I’ve been working on the sound for Public Studio’s current long-running project What Isn’t There, documenting the Palestinian villages of 1948, from which their Arab inhabitants were displaced and exiled. This latest installment in Public Studio’s 15-year process with the villages is a multi-channel film installation featuring 14 villages. Up until last week, I had never traveled to Israel/Palestine, and so had been learning about the area through various books, news and editorial media and through immersion in the sound recordings from Public Studio’s location shoots so far. 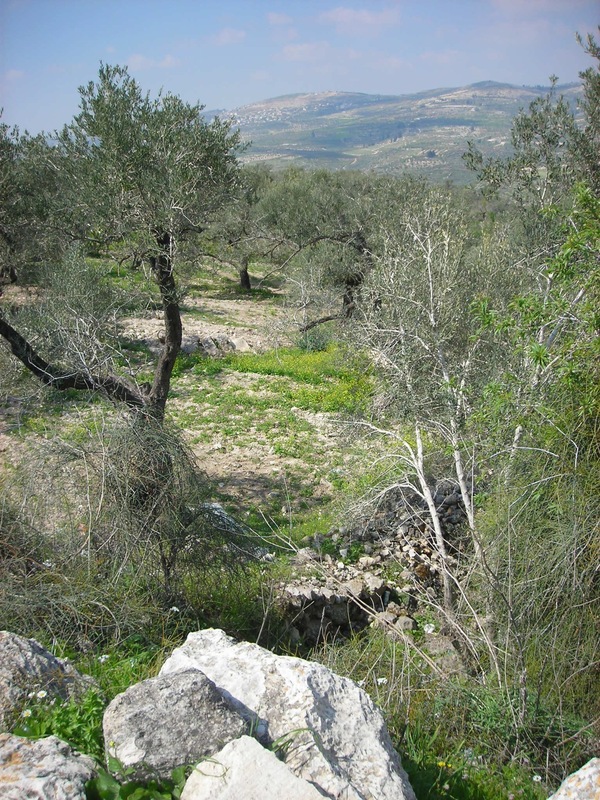 Last week I finally went there myself, to take the Public Studio deluxe tour of the West Bank, record sound at some village sites, and to try to parse the long history of conquests that is writ large on the landscape, from Roman ruins to Marmaluke fortresses to Palestinian olive groves to Bedouin encampments to Israeli army bases, checkpoints, and walled-in settlements. The current situation is quite literally inscribed on the land, revealing that this is now a battle that is largely being fought by pervasive, insidious construction and control of infrastructure, where the one with the biggest walls, the fastest roads, and control of the checkpoints wins. On the hilltops in Palestine, the radio communications towers are the one of first indications that an illegal Israeli settlement is coming, bringing walls and soldiers and strangely Santa Fe style-suburban homes with them. Meanwhile, time seems to stand still, in a way, in the hazy hills around Nablus or Ramallah, where lemon trees and olive groves flourish in the terraced hills, drivers are fearless, people are kind and hostly, and the dust blows forward and the dust blows back.